one thing i will say is, do you plan implementing dynamic/procedural generation with crocotile ? Yeah, it is lonely here Thanks for posting your work! It looks great! Always fun to see what others are making with Crocotile3d, and it also helps me see in what ways people are trying to use it. Looks like you're getting the hang of it pretty well. Your dynamic/procedural idea sounds interesting. Adding the ability to load a file with positions/directions, and then placing prefabs based on those would be entirely possible to do. and one that doesn't include names, and you simply choose the prefab in crocotile3d to place at all positions in the file. Also, a way you could do it right now, if you don't mind using a lot of objects in your game, is to create the pieces in crocotile3d, export each of those, and then read the positions based on your generator to load them into your game (so instead of crocotile3d it would be your game that positions everything). I still like your suggestion though, since it would enable the ability to automate placement of prefabs for people that need to do that. 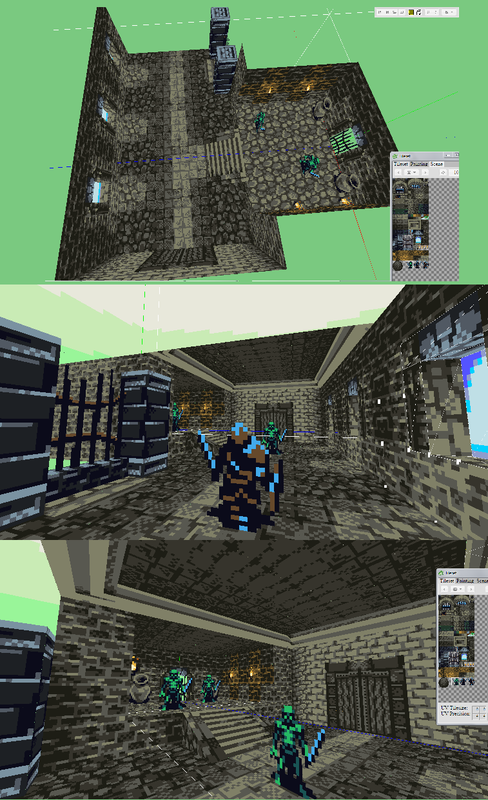 Cool looking dungeon- I like how you colored the bricks near the torches, and the lighting near the windows. I hope you continue sharing what you make. I don't know if you wanted any feedback on the crocotile3d scene. You seem to have a good eye for detail, based on how you're tiling things. btw, your first image wasn't showing, so I edited your post to fix it. well tbh im almost glad it's this lonely, gives me a chance to chat with the developer ! I mean like stored in the croco3D file, and alongside that having an option to export/import them ? Ah, yea I've seen that tileset before, but I guess I didn't recognize it. The prefabs can be exported as .obj files or .c3dp files. The c3dp files can be imported back into crocotile3d, so that you can take a prefab you build in one scene and use it in another without having to rebuild it. It doesn't really matter what their names are. But yea, if the generator/automation process/etc were to "load" the chests into the scene when reading the file, it could be made to look for a prefab named "chest", and use that. So whichever chest prefab you imported for that scene would be used as long as the name matches. Then you could could have a different scene for each level-type. At the moment I don't think any vertices get merged, but I could add the option on export to do it. Also, you can only use one texture per .obj file. So if you are using two textures in the scene, exporting to .obj will only export the currently selected texture, and it will include any geometry that uses that texture in the .obj file. This requires you to manage your textures in a way that works for you, and exporting for each texture. So it is suggested that prefabs use only one texture- but you're not forced to do so. Exporting the .c3dp file will export all textures and importing a .c3dp will import all textures that it uses. There is a Combine Tilesets option to help with removing duplicate textures if you have any. Prefabs do already have an anchor point. It defaults to wherever the current 3dCrosshair is when you create the prefab. But you can also move this anchor point by selecting the prefab listed under the Scene tab and clicking the button to reassign the origin to where the crosshair is. You can also add more points and export a list of them. Being able to see selected faces from behind sounds like a good idea. I'll have to test that out. - isn't it possible to mirror objects ? - perhaps you might make options on how the movement keys work - I, for one, would prefer wasd to be for horizontal movement and space+s and space+w to be for height, no matter the angle at which the camera is facing. You could just click directly on a vert, hold mouse button down and drag it, and it should just drag one if they are overlapped. Holding shift will snap it to nearby verts. When you drag it this way, it will position based on the camera angle, so you can rotate the camera to drag it different ways. To mirror, the R and F keys mirror and flip the selection relative to the crosshair. This will flip the direction of the faces too, so you can hold Shift and press R to reverse the faces if any faces are selected. Shift+F will flip the edge of the two polygons in each selected face. I'm reworking the keymapping system, so once that is done, you will be able to change how the movement keys work like you describe. Yeah, vert/poly count, selected verts, etc needs to get added. I'll try to round up a list of all the little tasks like that and work on getting them in. Yeah, 2d objects is on the todo list. I plan to incorporate that in a similar way for light entities. Have prefabs with an attribute to make it always face the camera. and good luck on those exams.